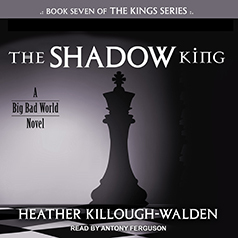 Heather Killough-Walden presents the seventh novel in the Kings series. Contains mature themes. King of the Shadow Realm . . . Beyond the Twixt, just past the Unlit Forest lies a realm so gravely perilous, it has been cut off from the mortal world for thousands of years. The powerful man who rules this tangled, twisted land is as dark and merciless as his realm. That darkness in him calls out, endlessly hunts, and searches far and wide—ever seeking the soul that can make it complete, the one who can end the loneliness that threatens his entire kingdom. Warlock of the fae . . .
Violet Kellen is one of two Tuath unseelie fae to have studied the rare art of dark magic to become a warlock, and now she must use those skills to save the other one—her sister. She foolishly ventures into the forbidden Dark on a rescue mission, and is ultimately thrust into a world she couldn't fathom—and into the arms of a tall, dark savior who fills her with a fierce desire nearly as brutal as his own.